25 April 2018 (Toronto, ON) – Whenever The Rolling Stones do anything, they do it with quality and gravitas. Having defined rock’n’roll in the ‘60s, The Rolling Stones entered their imperial phase in 1971 with their album, Sticky Fingers. What followed is a run of albums that couldn’t have happened at any other time, by any other band: the decadent excess of Exile On Main St, the Jamaican voodoo swamp of Goats Head Soup, the disco and punk-infused prowl of Some Girls. With each new decade, the Stones evolved while staying true to their roots, coming full circle in 2016 with Blue & Lonesome, a love letter to their first inspiration: the blues. 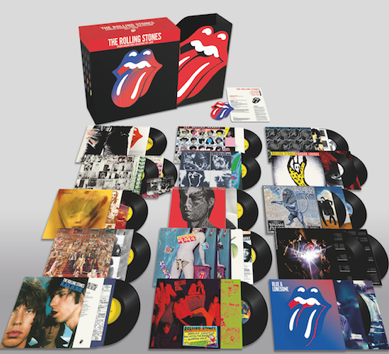 Today, The Rolling Stones announce The Studio Albums Vinyl Collection 1971-2016, a brand new limited edition vinyl box set slated to release on June 15 via Universal Music Canada, the country’s leading music company. Featuring 15 albums across 20 LPs, the collection is available for pre-order here. View the unboxing trailer here. The Studio Albums Vinyl Collection 1971-2016 presents this monumental era in rock’n’roll history in a highly bespoke, lenticular mounted, limited edition box-set housing the 15 studio albums from Sticky Fingers through to Blue & Lonesome in faithful and intricate original packaging replications. Every album has been lovingly remastered and cut at revelatory half-speed at Abbey Road Studios, from vinyl specific original tape transfers designed to get the very best possibly sound from the format. Pressed on heavyweight 180-gram black vinyl, each album also includes a download card for HD digital redemption of the catalogue and includes a numbered certificate of authentication. Special care has been taken to create packaging to the same high standards, with detailed artwork reproduction for each album including Some Girls, which comes housed in the replica design including 20 cut-outs on the cover, while the sleeve of Sticky Fingers is presented as Andy Warhol’s original design, complete with a working zip with a hidden image underneath and Exile On Main Street comes with a set of 12 original postcard inserts.